The Conservative Party would have you believe that NHS England is responsible for its own predicament, but the figures suggest otherwise in a damning way. It is Conservative interference that has caused the collapse of NHS finances. 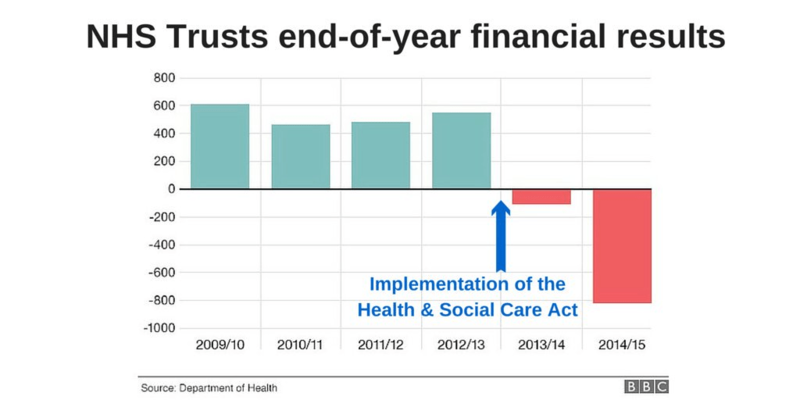 The Health and Social Care Act of 2012 was a disaster for the public service. The insertion of private ‘healthcare providers’ into the service has diverted funds away from healthcare and into profit. That, along with the other changes in the Act, have led to the “deteriorations in the financial positions” of NHS organisations, exactly as predicted in the NHS London risk register of the time – and no doubt in the risk register for the whole of the NHS that the Tory-led Coalition Government of the time suppressed. These are the facts of the matter. Don’t let a Tory tell you otherwise. Generally speaking, I agree. This was an image picked up from Twitter, though, that I wanted to get out to readers. The image states that the source is the Department of Health, so why not do a quick search, along the lines “Department of Health [or NHS] financial results” – see what you get? So these same people are to be trusted for being open and transparent on all things Government instead they lie, cheat and remain silent when questioned many times on their NHS financial state……Not a good to time to be trusted with the EU vote data and being truthful……their history in the area of transparancy and truth is appalling similar to a nazi police state. All part of their underhand, evil plan. Another request for the source data, here. It’s dangerous to simply take what you read on the internet at face value, so please back up what you’re saying with the evidence. It’s interesting that, on one of the rare occasions when I don’t include the source information because I want to get the information out quickly, there are still people who would rather write in to complain than go to a search engine and type in “NHS end-of-year financial results”. Fortunately the number of such people only amounts to two (so far). I find that encouraging. And it is not just the “insertion of private health “care” providers” that is depleting NHS funds, but also GeoOsb’s insistence of continuing with the far more expansive PFI schemes, rather than using far cheaper gov resources, just to claim the Con Gov is reducing expenditure by keeping the outlays off the Con Gov’s books. Another sleight of hand slime.